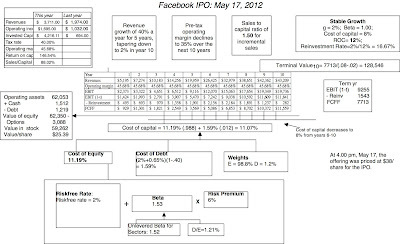 As some of you who have tracked my blog posts over the last couple of years know, I have tried to make sense of Facebook's value and how the market has been pricing it. Given today's news, I thought it would be useful to go back first to these earlier posts and then do a fresh valuation of the company, with updated information. Facebook had perhaps the most elaborate run-up to an IPO in stock market history, with billions of dollars in transactions in the private share market, stories aplenty in the news media and even a hit movie about its founders. 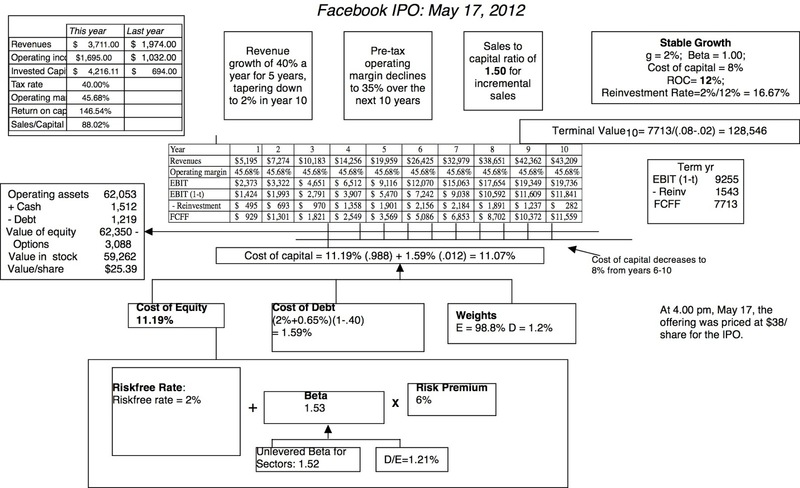 My first attempt at valuing Facebook was in February 2012, when I attached a value of $68 billion to its equity, with extremely generous assumptions on revenue growth and margins. In estimating this value, I assumed that Facebook would have a revenue growth path very similar to Google's, while sustaining operating margins like Apple. As the initial public offering drew nearer, I grew increasingly wary about the offering for two reasons. The first was the sense that many investors, especially institutional, seemed to think that the Facebook IPO was an absolute no-lose proposition, no matter what the offering price was, since momentum would carry the stock higher. In this post, from February 2012, I cautioned investors from buying into this proposition. The second was that the company and its bankers seemed to assume that they could set the terms for the offering and that the market could go along. In my experience, those who believe that they have power over markets realize otherwise, sooner rather than later. The actual offering date is now part of market lore, from the technical problems that NASDAQ had in getting the trading started to the substantial support that the investment banks had to offer to keep the price from collapsing. After an initial spurt in the price to $42, the stock ended the day at $38.23 a share. Once the price support faded, the stock price retreated in the weeks after the IPO to drop below $30 in June 2012. In a post after the IPO, I argued that the market reaction to the IPO was just desserts for the arrogance and hubris of both investment bankers and the company in the lead up to the IPO. In the months after the IPO, Facebook faced a mountain of troubles, some of its own doing and some reflecting the costs of going public. The IPO failure colored investors' views of the company and its management, leading them to put the worst possible spin on every action and occurrence at the company. At the same time, the IPO also exposed the company to significant costs, especially as the costs of stock-based compensation were recognized, leading to a drop in operating income. The nadir for the stock was the quarterly earnings report about a year ago, when the company reported sagging revenue growth and much lower margins. The momentum game turned fully against the company, with many of the analysts and institutional investors who had been cheerleaders in the pre-IPO days arguing that the stock was a "sell". 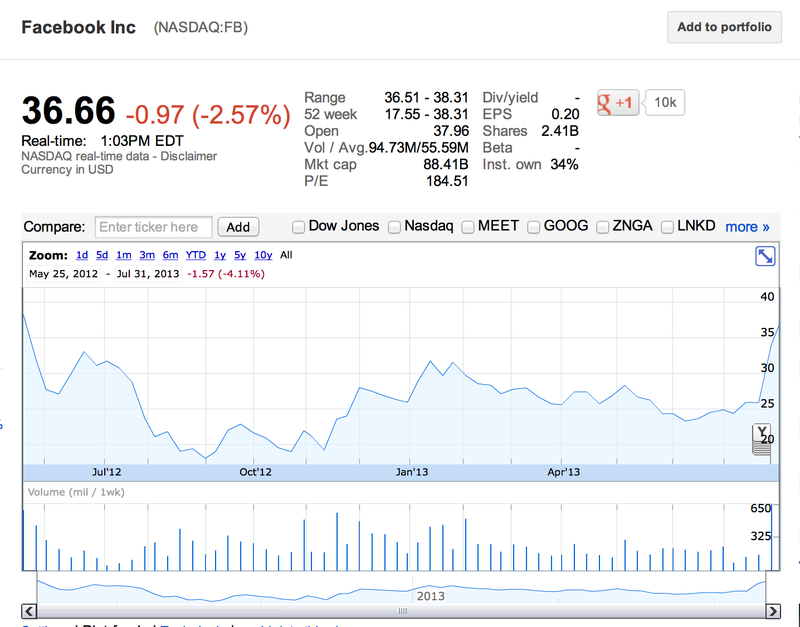 On August 20, 2012, Facebook had dropped below $20/share and I made an argument that the market had over reacted to news and that the earnings reports were not as catastrophic as they were perceived to be. I also argued that investors were being distracted by side stories about expiring lock ups and mobile mashups. In fact, my estimate of value in August 2012 was $23.94, just a couple of dollars below my estimate on the day before the IPO. At the end of the post, I noted that I had a limit buy order at $18/share on the stock and that notwithstanding my concerns about corporate governance in the company and the near term effects of momentum, it looked like a decent buy. Now, a confession. 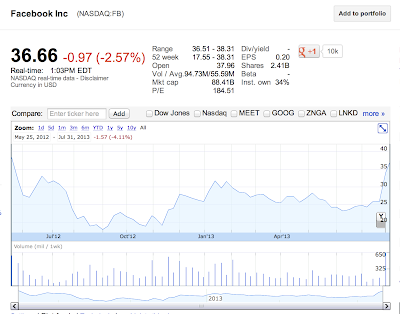 I had never, ever bought a stock on the date that it hit its absolute low, until my limit order for Facebook got fulfilled at the start of trading on September 4, 2012. The stock hit its low of $17.58 that day and, even with setbacks along the way, it has not looked back since. I would love to claim timing precision but it was absolute luck, and I would rather be lucky than good. Revenue growth continues to be strong: Revenues at the company over the first two quarters of the current financial year have been about 46% higher than revenues in the first two quarters of the last financial year, just above the expected growth rate of 40% used in the IPO valuation. Operating margins remain high: Operating margins declined last year, primarily because of the expensing of stock-based compensation from pre-IPO days. That load has been lifted in this fiscal year and the operating margin over the last four quarters is about 30%, if R&D is expensed, and closer to 40%, if it is capitalized. Facebook remains for the most part an "advertising" company: While Facebook has made attempts to broaden its revenue base and product mix, it remains dependent upon advertising for 84% of its revenues in the last four quarters, not significantly different from pre-IPO days. Facebook seems to have broken the "mobile media" code: It is true that the last few earnings reports have included good news on the mobile media front, with Facebook showing the capacity to deliver, but am afraid that I don't share the euphoria with which some investors have greeted this news. Don't get me wrong! Being successful in mobile media is critical to Facebook's success but the revenues that I (and others) have projected for Facebook last year assume that success. So, the good news in the mobile media market keeps them on the forecasted revenue path, but failure would have been devastating. Management has matured: If there is good news that came out of the botched IPO, it is that the managers at Facebook (from the top down) seem to have learned two critical lessons. First, they no longer seem to be taking markets for granted and are taking the effort to explain not only what they are doing but why. Second, they seem to have realized that analysts and bankers don't lead the market, but follow it. Nevertheless, the company remains a corporate governance nightmare, with voting rights concentrated in Mark Zuckerberg's hands, but at least for the moment, he seems to be behaving more like a benevolent monarch than a malevolent dictator. Incorporating the information in the last earnings report, I tweaked my valuation of Facebook and the word "tweaked" is used intentionally. None of the big news in the earnings reports represents significant departures from assumptions made in earlier valuation. The good news in revenue growth and operating margins was already being assumed and the fact that Facebook remains an advertising driven company puts limits on how big revenues can get. My estimate of value per share for Facebook has risen from $24/share at the depths of despair last August to about $27.65/share today (July 31, 2013). As always, you are welcome to download the spreadsheet and replace my assumptions with yours. The old "buy and hold" advice, where we are told to buy good companies and leave them in our portfolios for posterity, makes little sense with growth companies, where markets often over shoot and under shoot. Last August, it was my belief that markets were over reacting to limited information in an earnings report from a young company and pushing its price down too much. Today, I believe that the markets are over reacting again to limited news from an earnings report and pushing the price up too much. As an investor who was lucky enough to buy last August, because the stock was trading below my estimate of its intrinsic value, I have to be consistent and sell, if the opposite holds now. The only pragmatic consideration that I have relates to taxes, since I will save substantially, if I can wait until September 4 to sell (when my gains will become long term capital gains). So, what if you don't own the stock? Should you sell short? I personally would not, since it is entirely possible that the momentum game that was so firmly against Facebook last year might work in the other direction now. There may be investors who will be drawn in to the stock if it crests the $38 IPO price, though there is really no economic or value significance around the number. One final note. Even though I am selling Facebook, I will continue to follow the company. After all, the company may very well fall out of favor with investors in a few months and be back on my buy list. Bipolar markets are sometimes an intrinsic value investors best friend. In my last two posts, I looked first at measures of country risk, both from a default risk and an equity market perspective, and then at stock pricing, using earnings and book value multiples, across developed and emerging markets. In summary, the conclusion that I drew was that the shift away from emerging markets in the last six months may be obscuring a much larger shift towards convergence between emerging and developed markets over the last decade. Thus, we can debate whether this convergence is rational or overdone, but it is quite clear that stock markets around the world have more in common now than they are different. Having said this, it is worth noting that the developed and emerging market categories that I used in the last post, which were based on geographic location, may no longer reflect the reality that there is vastly more diversity within each region than there used to be. In this post, I intend to look at the pricing of stocks, by country, not only to illustrate this diversity but also to look for mis pricing, at a country level, around the globe. The price earnings ratio, notwithstanding its volatility and measurement weaknesses, remains among the most widely used tools in investing. In fact, some global investors still compare PE ratios across countries and often direct their money towards countries with low PE ratios, on the presumption that this must indicate "cheapness". To put this approach into practice, I first computed PE ratios in June 2013, by country. During the computation, I noted a couple of phenomena, which while unsurprising, are still worth emphasizing. The first is that almost 60% of all companies globally have negative earnings and PE ratios are thus not meaningful for these companies. 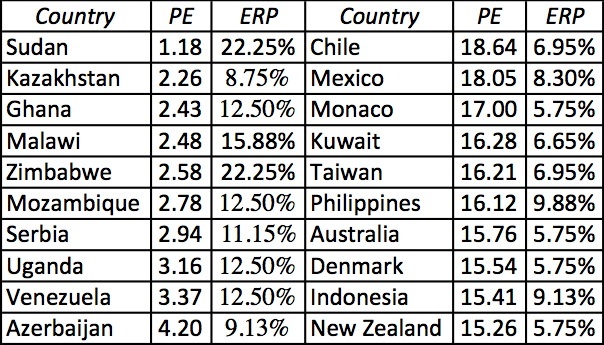 The second is that there are significant outliers, with a few companies with exceptionally high PE ratios (usually because earnings have dropped to close to zero) pulling the averages to high numbers, especially in countries with relatively few companies. To get a more representative value, I computed the PE ratio based on aggregate values for market capitalization and net income. Put simply, I summed up the market capitalization of all the companies in a market and divided by the total net income of all companies in a market. This aggregate value is not as sensitive to outliers and reflects more closely a weighted average of the companies in the market, with values representing the weights. The heat map below allows you to compare PE ratios across countries, and within regions. Note that the countries with the lowest PE ratios (in yellow and orange) are also among the world's riskiest (a large swath of Africa, Venezuela (Latin America) and Eastern Europe). Put differently, these countries look cheap, but they have good reasons to be cheap. The bulk of developed markets have PE ratios between 10 and 15, with the weighted PE ratio at 10.49 for Germany, 12.81 for Japan and 14.27 for the US. Surprisingly, Mexico and Chile have the highest weighted PE ratios, with Mexico at 18.04 and Chile at 18.64. There are also large sections of the world where PE ratios cannot be computed, either because earnings information is not available or because earnings are negative. If most of the low PE countries are high risk and the bulk of the high PE countries are low risk, we have to use more finesse in looking for cheap and expensive markets. In fact, a cheap market would offer a combination of a low PE and low risk and an expensive market would be one with high PE and high risk. 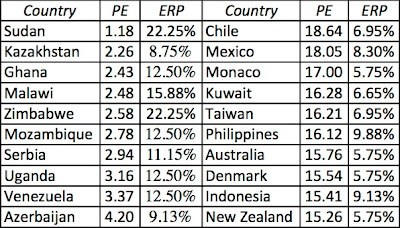 To look for those mismatches, I combined the PE ratio dataset with the equity risk premiums estimated in the prior blog post and generated a list of the ten countries with the highest and lowest PE ratios, with accompanying equity risk premiums. 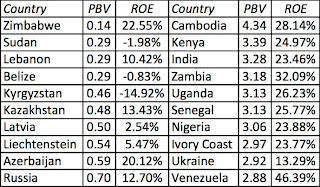 Of the ten countries with the lowest PE ratios, only two (Kazakhstan and Azerbaijan) had equity risk premiums less than 10% and I cam not tempted to invest in either country (given their dependence on commodity prices and political risk profiles). There are more interesting countries on the highest PE list, though a couple reflect commodity price volatility; the drop in copper prices, for instance, has hit Chilean company earnings harder than it has market capitalizations. 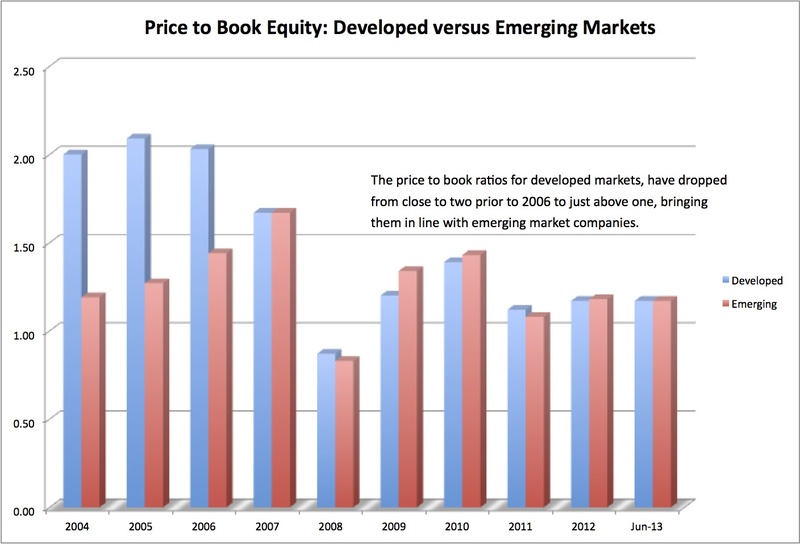 Unlike PE ratios, there seems to be little relationship between the dispersion of price to book ratios across the globe and country risk. Some of the highest price to book ratios are in the riskiest countries: Namibia, Indonesia and Venezuela all have price to book ratios that exceed 2.50 and are all high risk countries. 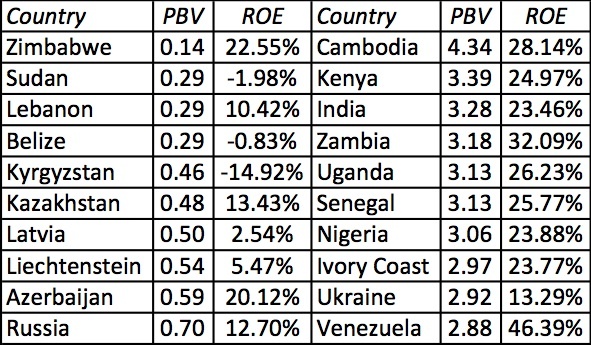 Note that the countries with the highest price to book ratios also tend to have very high returns on equity, whereas some of the countries on the lowest price to book ratios have negative or low returns on equity. There are some mismatches, especially on the low PBV list, with Zimbabwe, Lebanon and Russia joining Kazakhstan and Azerbaijan as markets with low price to book ratios and high returns on equity. In addition to all the caveats about hidden (and not so hidden) risks, it is also worth noting that some of these markets have only a handful of listings and no or low liquidity. This map more closely corresponds to the PE map, with riskier countries having lower EV to EBITDA multiples (with Mongolia being an exception). The median value across the globe is 8.03, with the United States (8.45), Australia (8.59), India (9.48) and China (9.99) trading above the value and much of Western Europe trading below. 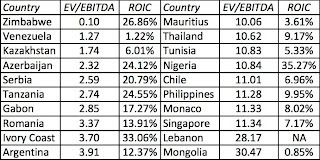 Unlike with equity multiples, the relationship between ROIC and EV/EBITDA is in the inverse of expectations, with countries with the higher (lower) returns on invested capital having the lowest (highest) EV/EBITDA multiples. At the end of the comparisons of equity and enterprise value multiples, I must confess that I feel little inclination to make abrupt asset allocation judgments based upon any of these multiples. It is true that some markets seem to offer better risk and return trade offs than others, but these markets seem to come with warning labels (about political or commodity price risk). It is also possible that I am missing some hidden patterns here and you are welcome to download the dataset containing my estimates of both average and aggregate values, by country. Notwithstanding the noise in the numbers, I am glad that I was able to look at the numbers across countries. I feel a little more informed about how stocks are being priced across the globe and how investors are pricing in the most extraordinary and unusual risks in some markets. I also realize how much I have left to learn about how stocks are priced in countries with non-traditional risks and will keep working at filling in the gaps in my knowledge. 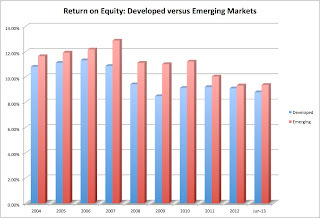 Developed versus Emerging Markets: Convergence or Divergence? In my last post, I looked at country risk first from both a bondholder perspective (with ratings, default spreads and CDS spreads) as well as an equity investor perspective (with my estimates of equity risk premiums by country). While default spreads in sovereign bonds and differences in CDS spreads are explicit and visible to investors, the question of whether equity markets price in differences in equity risk premiums is debatable. In fact, there are quite a few analysts (and academics) who argue that country risk is diversifiable to global investors and hence should not be priced into stocks, though that argument has been undercut by the increasing correlation across equity markets. In this post, I look at the pricing of stocks across different markets to see if there is evidence of differences in country risk, and if so, whether market views of risk have changed over time. Now, assume that you are valuing two companies with equivalent growth rates and payout ratios, in US dollars, and that the only difference is that one company is in a developed market and the other is in an emerging market. If investors in the emerging market are demanding a higher equity risk premium, the emerging market company should trade at a lower PE ratio than the developed market company. So what? A simple test (perhaps even simplistic, since holding growth and payout constant is tough to do) of whether equity risk premiums vary between developed and emerging markets is to compare the multiples at which companies in these markets trade. If emerging markets command higher equity risk premiums, you should expect to see stocks trade at much lower multiples (PE, PBV, EV/EBITDA) in those markets, relative to developed markets, for any given level of growth and profitability. 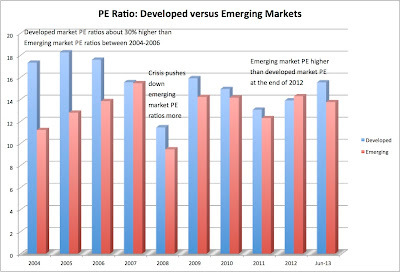 To examine how developed market and emerging market PE ratios have evolved over time, I computed PE ratios for each company in every market each year from 2004 to 2012, with an update to June 2013. I eliminated any company that had negative earnings and divided the market capitalization at the end of each year by the net income in that year. I then categorized the companies into developed and emerging markets, using conventional geographical (but perhaps controversial) criteria. I included US, Canada, Western Europe, Scandinavia, Australia, New Zealand and Japan in the developed market group and the rest of the world (Latin America, Asia, Africa, Middle East and Eastern Europe/Russia) in the emerging market group. In sum, there were 36,067 companies in the developed market group and 24,429 companies in the emerging market group. I considered various summary statistics (the simple average, a weighted average, an aggregate market cap to earnings) but decided to use the median PE as the best indicator of the typically priced stock in each market. In the figure below, you can see the median PE ratios for developed and emerging market companies by year, from 2004 through June 2013. 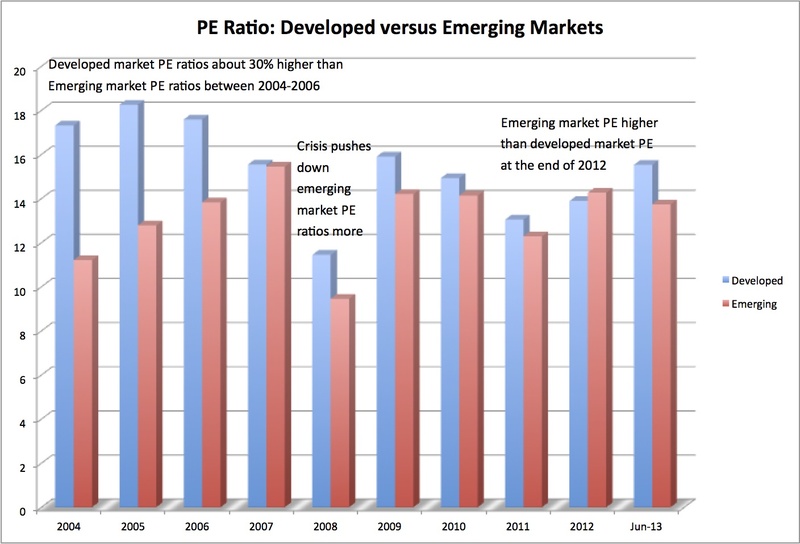 Prior to 2006, emerging market PE ratios were about 30% lower than developed market PE ratios, but after almost catching up in 2007, the banking crisis of 2008 caused a drop in emerging market PE ratios, relative to developed markets. In the years since, emerging market companies have clawed their way back and the PE ratio for emerging market companies exceeded that of developed market companies in 2012. The shift away from emerging markets in the first six months of 2013 has put developed companies into the lead again, though the developed market PE premium (over emerging markets) in June 2013 is significantly lower than the premiums commanded in the early part of last decade. 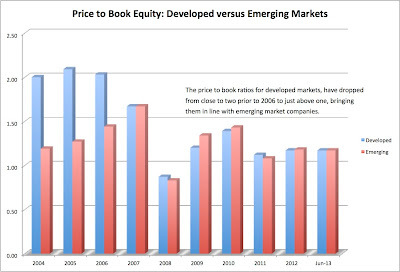 The convergence that we see in PE ratios is even more striking when it comes to price to book ratios, but note that the convergence is largely coming from the drop in price to book ratios in developed markets, not from a increase in those ratios of emerging markets. The convergence in PE ratios and PBV ratios between developed and emerging markets is confirmed when we look at other multiples (EV/EBITDA, for instance). The question therefore becomes not whether there is convergence, but why the convergence is occurring. There are at least three possible stories (and perhaps more). 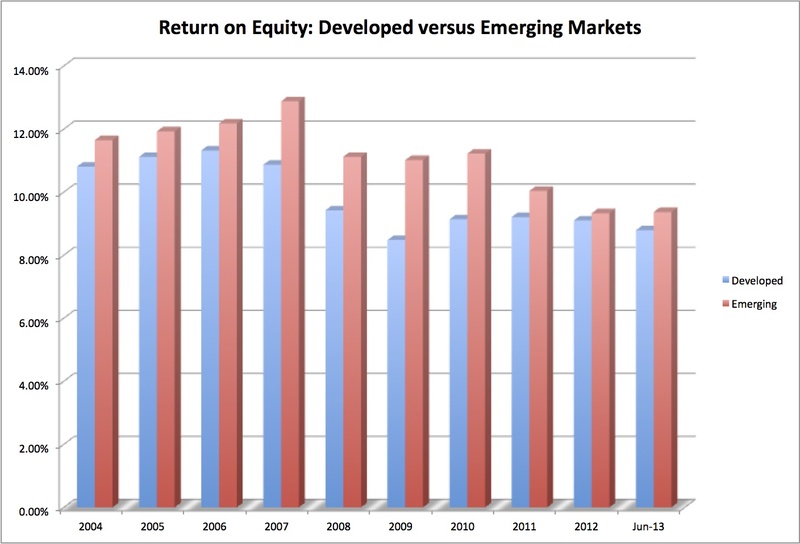 Note that emerging market companies have had higher returns on equity than developed market companies in every year. While the 2008 crisis has resulted in declines in return on equity across both groups of firms, developed market companies have almost caught up in terms of return on equity with emerging market companies, suggesting that it is not profitability that explains the PE/PBV convergence. To compute the costs of equity in US dollar terms, we will set the expected growth rate for each year to be equal to the US treasury bond rate in that year and derive the cost of equity for developed and emerging markets in that year. I know that assuming the same growth rate in developed and emerging markets is simplistic, but I will revisit this assumption later. The last column is striking, as the differential ERP dropped close to zero at the end of 2012 before rebounding a little bit in the middle of 2013. In fact, at the 0.50% level in 2013, it is still well below historical norms. 3. Decline in differential real growth: Now, let's revisit the assumption that I made in the last section that both developed and emerging markets will grow at the same rate (set equal to the US treasury bond rate each year). You can take issue with that assumption, since emerging markets have not only more growth potential but have delivered more real growth that developed markets over the last two decades. If you assume higher growth in emerging markets than developed markets, the table above overstates the equity risk premium for developed markets, while understating the premium for emerging markets. I redid the table setting the growth rate in developed markets at 0.5% below the risk free rate, while allowing the growth rate in emerging markets to be 1% higher than the risk free rate; this results in 1.5% difference in annual real growth rates between the two groups. While the differential ERP is higher in every year, with the assumption of higher growth in emerging markets, the trend line remains unchanged with the differential value hitting a low at the end of 2012. Unless you assume a widening of the difference in expected real growth between developed and emerging markets between 2004 and 2012, which would be difficult to justify given the growth in size of emerging markets over that period, a decrease in differential equity risk premiums seems to be the most likely explanation for the convergence in multiples across markets. In summary, the shrinking differences in pricing between developed and emerging markets cannot be explained by profitability trends or changes in real growth but can be at least partially explained by narrowing risk differentials between the markets and the globalization of companies. Reality check for expectations in emerging markets: For the last two decades, developed market investors have been lured into investing in emerging markets by the promise of higher returns in those markets, though accompanied with the caveat of higher risk. If the last few years are any indication, it is time for investors to adjust expectations for emerging market returns, going forward. Emerging market companies are no longer being priced to generate premium returns, but they are also no longer as risky as they once were (at least relative to developed market companies). Markets can still over shoot: While it is clear that emerging markets have evolved in terms of economic growth, political maturity and risk, it also remains true that there is more risk in these markets than in developed ones. Markets, however, often move in ebbs and flows, under estimating this differential risk in some periods and over estimating it in others. Thus, a reasonable case can be made that markets were being over optimistic about emerging market risks, when they priced stocks to generate roughly the same expected returns in developed and emerging markets at the end of 2012 (see the table in the last section) and that the correction this year is a reversal back to a more reasonable differential premium. For those who believe that the reasonable premium is that observed between 2004 and 2006 (when the average differential in ERP was 2.5% and higher), this would lead to the conclusion that there is far more pain to come in emerging markets. If you believe, as I do, that the norm is closer to that reflected in the average since 2008 (about 1 to 1.5%), the correction is about half way over. Think global, not local: As companies, notwithstanding where they are incorporated, increasingly become global competitors, it can be argued that equity risk premiums will converge across markets, since each market will be composed primarily of global companies exposed to risks around the world. For investors and analysts in developed markets, there is the unsettling reality that emerging market risk is now seeping into their portfolios, even if it is composed purely of domestic companies. For investors and analysts in emerging markets, there has to be the recognition that the automatic discounts that they apply to emerging market company multiples, relative to developed markets, may no longer be appropriate. I will return to this issue in a future post. Investors have a mixed relationship with risk, forgetting that it exists in the good times and obsessing about in bad times, and nowhere is this dysfunction more visible than in emerging markets. After a few years where investors seemed convinced that emerging markets were no riskier than developed markets, they seem to have woken up to the existence of risk in emerging markets, with a vengeance, in the last few months. As emerging markets around the world have been pummeled, analysts have sought to assign blame. Some have pointed the finger at the Federal Reserve, claiming that mixed signals on quantitative easing and the steep rise in US interest rates have caused currency and market fluctuations globally. Others attribute dropping stock prices to slowing economic growth in the largest emerging markets, with China at the top of the list. There are a few who point to the rise of country-specific political factors, with governments in Brazil and Egypt facing pressure from their populace. While there is some truth to all of these explanations, there is a more general lesson about risk in recent market movements. While the last five years have seen a narrowing of the risk differences between developed and emerging markets, partly due to the maturation of emerging markets and partly because developed markets seem to have acquired some of the worst traits of emerging markets, emerging markets still remain more vulnerable to global economic shocks than developed markets. That does not make them bad investments but it does mean that investors should demand premiums for investing in emerging markets, with higher premiums for riskier markets. If you accept this proposition, it follows that you cannot value or invest in companies with emerging market risk exposures without having estimates of risk premiums by country. At the start of each year, for the last two decades, I have put up my estimates of risk premiums, by country, on my website. For the last three years, in response to the rapid intra-year shifts in country risk, I have also done mid-year updates. After the turmoil of the last few weeks, I decided that this would be a good time for a mid-year country risk update. The most easily accessible data on country risk takes the form of sovereign default risk measures. While ratings agencies have been assigning ratings to sovereign bonds issued by countries for decades, the growth of the credit default swap (CDS) markets have given us access to CDS spreads for a subset of these countries. Ratings agencies have been critiqued since the banking crisis of 2008 for being being biased (in favor of issuers) and overlooking major risks, but I think the bigger problem with them is that they are slow in reacting to change. That effectively makes sovereign ratings into lagging indicators of country risk. 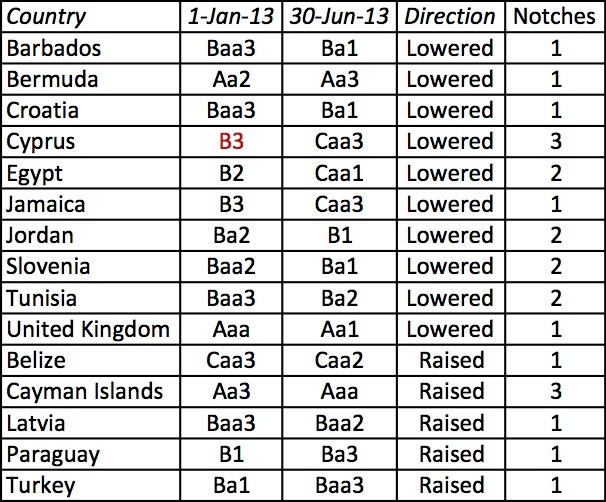 Note that 9 of the 15 ratings changes were only a single notch, four were two notches and two countries saw their ratings improve three notches (with the Cayman Islands moving up three notches to Aaa and Cyprus moving down three notches to Caa3). 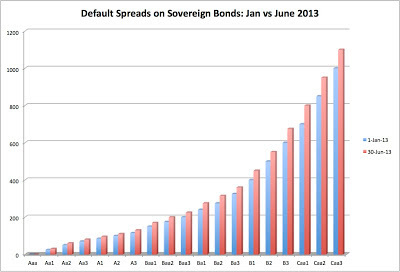 Sovereign default spreads are about 10-15% higher than they were six months for most of the ratings classes. The credit default swap market is a quasi-insurance market, where investors can insure against country default risk; thus the CDS spread of 2.50% for Brazil at the end of June 2013 can be viewed loosely as the annual cost of insuring against default on a Brazilian US$ denominated government. While I have posted on the limitations of the CDS market, it does have one significant advantage over the sovereign rating process. It can and does react (sometimes too much in the view of its critics) instantaneously to events unfolding in real time in individual countries. As a consequence, it is much more volatile than ratings-based measures of default risk. Sovereign CDS spreads are available for 63 countries and the attached file has the CDS spreads in January and June 2013 for all of the countries. 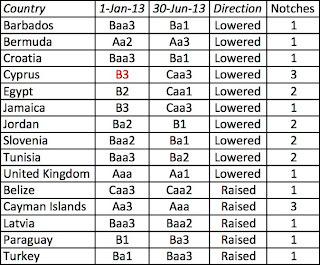 In contrast to the ratings, the CDS spreads changed for every country on the list between January and June and the changes are dramatic in some cases. Across the entire list, the median (average) change in CDS spread was 14.54% (17.45%) between January and June, consistent with the uptick in default spreads over the same period. Thus, Brazil, which did not see any change in its sovereign local currency rating between January and June 2013, did see a 74% increase in its CDS spread, reflecting the political unrest of the last few weeks. Interestingly, every one of the ten countries that saw the biggest percentage increases was an emerging market, with six of the top ten countries on the list coming from Latin America. On the list of companies that saw the biggest decreases in CDS spreads, eight were developed markets with only two emerging markets (Costa Rica and Romania) making this list. If nothing else, this table indicates that in the market's view, the divergence in risk between developed and emerging markets widened over the period. 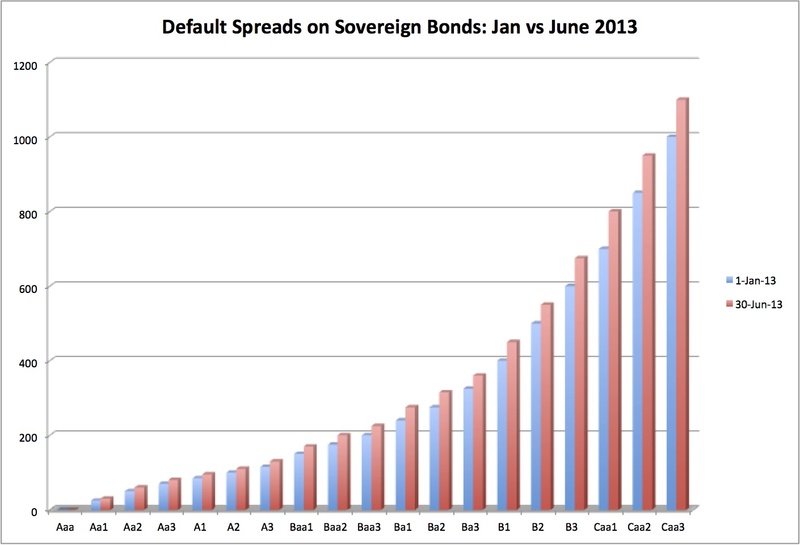 There are some who view both sovereign ratings and CDS as too narrow in their focus of debt. A country that has little exposure to default risk can still be exposed to other types of risk. There are services that try to provide more comprehensive measures of country risk, encompassing economic, political and legal risks. Political Risk Services (PRS), for instance, provides measures of country risk on different dimensions as well as a composite measure of country risk. These scores are numerical, with higher scores indicating safer countries and lower scores signaling more risk. Almost all of the countries on both lists are emerging markets, which is to be expected since you would expect the biggest volatility in risk scores in these countries. Thus, Latin American and African countries dominate both the “increased risk” and “decreased risk” lists, with this measure. While default risk measures can be used to price sovereign government bonds, it is an open question as to whether they should affect or be used in equity pricing. While there are some who argue that country risk should be diversifiable to a global equity investor, the increasing correlation across countries has made that argument difficult to defend. I believe that equity risk premiums vary across countries and that the variation is correlated with the default spreads for these countries. In fact, I posted on country risk premiums and the different approaches for estimating country equity risk premiums a year ago, when I made my mid-year update for the 2012 data. I use a two-step approach to estimating country risk premiums (CRP) for markets where I start with the default spread for country in question (obtained either from the sovereign rating or the sovereign CDS) and scale up that spread for the higher risk in equity markets. I am using my July 1, 2013 estimate of the implied equity risk premium for the S&P 500 of 5.75% as my mature market premium. You can download the spreadsheet that contains the equity risk premiums by country by clicking here. I have added a lookup sheet to the spreadsheet, where you can pick any of the 135 countries for which I have data and pull up sovereign ratings, CDS spreads and my estimates of risk premiums. I hope you find it useful. There are about 30 countries that don’t make this list because they do not have sovereign ratings or CDS spreads. If you happen to be investing in these countries, I do have a suggestion. I have a table of countries classified by PRS score into groups at this link, with an average equity risk premium by group. You can find the group that your country falls into and find another country in the same group that I have estimates of equity risk premiums and country risk premiums. To illustrate, neither North Korea nor the Democratic Republic of Congo is on my equity risk premium list, but based on their PRS scores, they are in the same group as Venezuela, which has an estimated equity risk premium of 12.50%, based on its rating. I know that this is simplistic but desperate times call for desperate measures. What can we learn from the sifting of these various measures of country risk over the last six month? Overall, while investors don't seem to think that the world as a whole is riskier than it was six months ago, their perception of where the risk is coming from has changed. They believe, rightly or wrongly, that more of the risk in the future will come from emerging markets rather than developed ones. While this is a break in the trend over the last five years, when risk premiums in developed and emerging markets converged, it is a shift back towards a pre-2008 world, when the risk differences between developed and emerging markets was stark. As investors, there are three big questions that we face that are related to the risk shift that we are seeing globally. The first is whether the adjustment is complete or ongoing; if it is ongoing, that would imply more pain to come in emerging markets and argue for shifting money from emerging to developed markets for the near future. The second is whether the stock price adjustments that have already occurred in emerging markets are commensurate with the risk shift. If stock prices have dropped too much (little), given the risk reassessment, it would be a good (bad) time to be in emerging market stocks. That will require more than an off-the-cuff judgment and I will look at it more closely in my next post. The third is whether individual companies with global operations are being priced correctly, as country risk assessments change. In past crises where emerging markets have become more risky, global companies that are based in these markets have often seen their stock prices drop too much. I will look at this question as well in a future post.